Three of our friends were celebrating their birthdays this July so we all thought why not go somewhere for a staycation and celebrate it. I was tasked to look for a great place to stay and I found Nordic Homes Tagaytay. It was love at first sight. I’ve always wanted to try interior designing so the moment I saw Nordic Home’s photos, I thought ‘this is it’. Plus, we were aiming for an accommodation with a pool. Growing up in the mountains probably made us crave for pools and beaches so much. Lol. If you want to take a break from camping, Nordic Homes Tagaytay will make you wish you never leave your room. It was raining when we arrived in Tagaytay. Our host, Ma’am Neri contacted me to say that she would be waiting by the 3rd-floor lobby. When we got there, there were tons of people. I was about to look for Ma’am Neri when I heard someone say ‘Joheins’. A lot of people pronounce my name like that. So I responded with ‘Johanes?’ and there she was, our host. She was so sweet and accommodating. She told us she had already written down our names on the guest book so all we had to do was sign. Boy, was I exhausted from the trip and excited to see the rooms so when she said that I was ready to give the place an 11/10 rating. Yup. After signing, she led us to the 23rd floor and showed us our rooms. We booked Vogue and Chic. That was my first time seeing a keyless lock (I knooooow. I’ve been camping out too much, I guess. Har har.). The rooms come with a key card that you can use to unlock the rooms. The first room shown to us was Nordic Chic. Here’s what Nordic Chic looks like (with my friends as models lol). Time to play some games. The second room was Nordic Vogue and we loved it so much. The room was decorated in black and white. It was dreamy. I want a room like this. The only difference between the two rooms is the design and the center table. Since there wasn’t any center table in Nordic Chic, the room was more spacious. So that’s where we all hung out, played games, danced and ate together. Aside from these two rooms, Nordic Homes Tagaytay has 9 more rooms. Vogue and Chic are also located on the 23rd floor with a max capacity of 7 persons each. Here are some of the photos of each room as posted by Nordic Homes. Here’s a photo of the pool. Depending on the room that you book, you’ll have access to free Netflix and PS4. Book on a weekday. Price is higher on weekends. Check-in is at 3 pm and check out is 1 pm. You can book via Airbnb or via Facebook at https://www.facebook.com/NorthernComfortsTagaytay/. 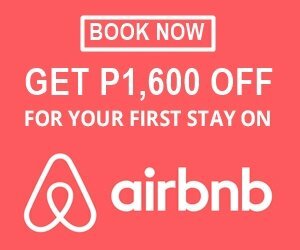 Sign up to Airbnb and get P1,600 off your first booking here at http://bit.ly/2mOgoFK. Since we were coming from Santo Tomas Batangas, here’s what we did. Ride a jeep heading to Calamba. Drop off at Turbina and ride a van going to Tagaytay just beside Jollibee. Most often, you have to wait for some time until the van has enough passengers to start. Ask the driver to drop you off at the new Mcdonalds. In front of the fast-food chain is the Tagaytay Prime Residences where Nordic Homes is located. Take a bus going to Tagaytay and ask the driver to drop you off at Olivarez, the fare is around P180. From Olivarez walk going to the new Mc Donald. In front of it, you will see Tagaytay Prime Residences. Rates vary depending on the room’s size, season and days. Prices indicated are for 2 persons. For every additional head, you have to pay P300.